How many tasers will it take to wake Waller County? “We were advised by legal counsel to cancel the meeting,” Prairie View City Councilmen Jonathan Randall said to the crowd of students and Prairie View community members crowded around the front door of Prairie View City Hall on October 15 to stand in solidarity with their City Councilman, the Honorable Jonathan Miller. Community members had been told that the City Council would be discussing the arrest of the Honorable Jonathan Miller. Yes, that Jonathan Miller. The one who voted to rename the road where she was arrested to Sandra Bland Parkway… twice. The Jonathan Miller who has written letters to Congresswoman Sheila Jackson Lee to press for answers to what happened to Sandra Bland. The one who was mysteriously tased and arrested in his own front yard by officers who knew him well; officers who told him they knew he was “always making problems” before they tased him. It was growing tiring to see the same faces show up in this situation as in the arrest and investigation of Sandra Bland. Yes, I am fully aware that in a small town there are not many options for who can erroneously order a City Councilman to be tasered, or who can oversee an investigation of potentially great financial importance. I know there are only six officers in Prairie View and Penny Goodie, who mocked Sandra Bland while she lay in the dirt, had a 1 in 6 chance of being the same officer who would order the Honorable Jonathan Miller to be laid down in the dirt. And I am fully aware that the District Attorney who called Sandra Bland “not a model person” would be the only District Attorney available to oversee the investigation of whether the Honorable Jonathan Miller was honorable or not. I understand it, but understanding it makes it none the less painful. Moving into the City Council chambers, the crowd filled the seats and began to have their say. The media had been notified by the mayor that the meeting was off and informed not to come, but there was one lingering cameraman and a reporter, as well as a journalist from the LA Times. The purpose of the meeting, without much press present, actually shifted to the community truly listening to one another and dialoguing. Without cameras and microphones, and with the City Councilpersons and Mayor in the back, mostly in street clothes, there was greater transparency amongst residents. It was actually the best environment I have experienced in that room thus far. Early in the morning, when I am in my bed, and I meditate and think about all the things that have been done, to my brothers and sisters by the police department and they just keep getting away with it. White supremacy is alive and well. And from time to time, I ask myself, what ever happened to the KKK? They used to be known by their white sheets and hoods, you don’t see that anymore. They did not fade into the wide blue yonder. My personal opinion? They did not just disappear. They have, I believe, infiltrated the police department. I believe they have traded in those white sheets and hood for a uniform and a badge and and a gun. And they have infiltrated the good officers. You can’t tell the bad policeman from the good officer. I honestly believe this where they have gone. Because here they can kill and get away with it. They can have their court system pick some more KKK guys, and this is just my opinion. Where did those guys go, who was once known as the KKK. You knew them when they showed up many, many years ago because they wore that distinctive uniform; and I believe they traded that uniform in for a blue uniform, a badge, and a gun. What if I tell you that the Mayor is also the Fire Chief and he had a Fireman’s Banquet and at that Banquet he honored Sheriff Glenn Smith. Or if I tell you that Waller County is the last county that emancipated slaves, but we don’t celebrate Juneteenth like we should. If I tell you that Sandra Bland was the first black body to be picked up by a white funeral home ever in Waller County. If I tell you that the first President of Prairie View A&M was a former slave of the first President of Texas A&M, then you start reevaluating where are we really? Because the true power is the power that is unseen. How can he be the Mayor of our city, and the mayor of the campus, those two jobs conflict. But he does not receive a payment for being our mayor, he is a volunteer. So in your best assessment, if you had a job that you volunteered for and a job that paid you over six figures, where are your loyalties. 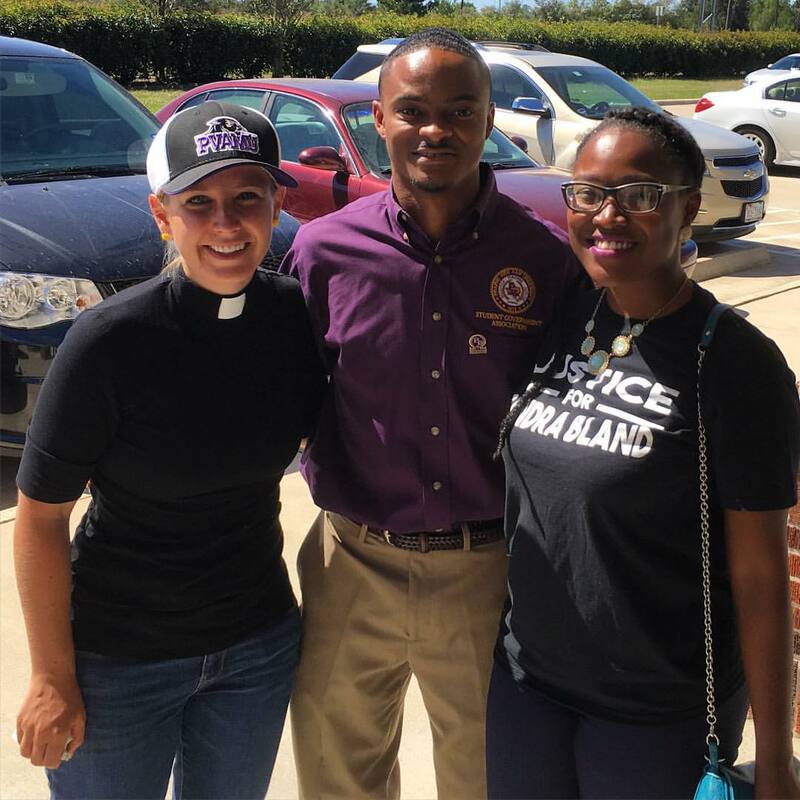 We can pray things will move more quickly for Jonathan than they have for Sandra Bland. 95 days have passed since the death of Sandra Bland in the Waller County Jail. 95 days of watching Waller County officials play games to delay or distort information while the family of Sandra Bland suffers without answers. 95 days of watching people change the story to try to make it fit the evidence. After 95 days of watching and praying, it was comforting to know that there are some people in Waller County who can be honest and transparent with one another. Those people, ultimately, are the Boss of all the rest, for it is the citizens who vote that truly do the hiring and firing of elected officials. In Waller County, as in many parts of the nation, the nature of the democracy is questioned by many after years of watching the political machine work. Yet, in each and every election, the people have a choice whether they will wake up and stop being cogs in a machine. Today, in Prairie View City Hall, the room was filled with people who had woken up. Perhaps if the machine is to be shut down, it will take an electric surge, the sizzle and flash of a taser. First there was the taser that the white, male Officer, Brian Encinia, used to threaten Sandra Bland and tear her from the safety of her car as Officer Penny Goodie pulled up to watch. Then there was the flash of light as the taser of the white, male Officer, Michael Kelly, drew blood from the back of the Honorable Jonathan Miller at the order of Officer Penny Goodie. In both cases, officials in Waller County see “nothing to be concerned about” in the treatment of either of these young, African American, Prairie View alumni. It is becoming increasingly evident, however, that they are alone in that opinion.